Experience Bend’s vibrant, local community with Bluebird Day! 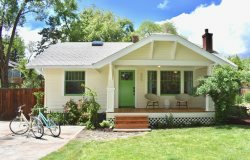 The Star Cottage is a 1920's historic Craftsman built during the time of Bend’s mill heyday, lovingly restored with all of the modern amenities and hip, eclectic charm. Soak in the private hot tub on the deck while your furry dog friends enjoy the spacious, open back yard. Hop on a cruiser bike and explore Bend like a local! Tucked into Bend's up-and-coming historic Hill Street neighborhood centered between the heart of downtown Bend, the Box Factory and Old Mill Districts, you can walk everywhere in minutes. Walk to Jackson’s Corner Restaurant (the local’s fave), Palate Coffee, Crux Brewing, Atlas Cider, and all the shops and restaurants downtown. WebCyclery, a huge bike shop in a historic church is around the corner, and Market of Choice, Bend's gourmet grocery is just down the street. So many delightful surprises await you in this historic gem! Charming and sunny with plenty of windows, gorgeous restored hardwood floors, hip and eclectic upscale furnishings and local art work. Cozy up with a good book, watch a movie, enjoy free high-speed internet, or play games with family and friends. Kids will love the Star Loft, equipped with 2 high quality twin futons. Enjoy outdoor living Bend-style! Challenge your friends to a game of 'corn hole' or croquet in the huge back yard, or toss a Frisbee with your dogs. Gather fresh herbs and berries from the gardens, grill out on the back deck or soak in your own private hot tub under a Central Oregon sky filled with stars. Prepare an unforgettable meal in the fully equipped gourmet kitchen newly updated with black stainless appliances. Sit-down dining for 6 makes for many wonderful memories to be made. The key to a fantastic vacation is a good night’s sleep! Enjoy gorgeous brand new European style bedding with high thread count linens, down duvets, and superior quality mattresses. The front bedroom has a King sized bed, and a Queen in the second bedroom. There are 2 high quality twin sized futons and linens provided in the upstairs Sky Loft (accessible by a ladder).